Bear Walker: Blow their minds with a customized, hand carved skateboard from Bear Walker. They will be in good company cruising on this board since they are ridden by Superheroes, Jason Momoa (Aquaman) & Grant Gustin (Flash). These boards are true works of art and look fabulous hanging on the wall or crusin’ down the street. DataBytes: The newest technology in location tracking is the Tracer from DataBytes. Everyone needs this handy device that will revolutionize the way we locate anyone or anything worldwide without Wi-Fi or Bluetooth! The only tracking device with unlimited range! Badeloft: Who doesn’t love soaking in the tub with a book and a glass of wine. 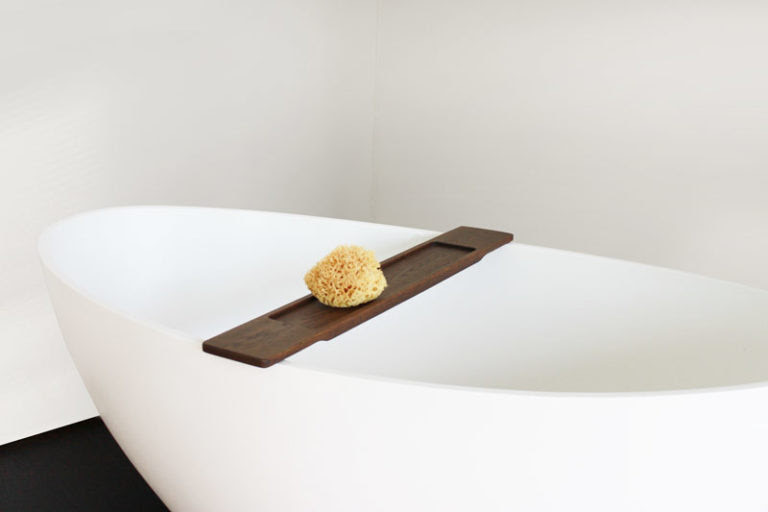 This dark oak bath caddy from Badeloft is a luxurious gift for everyone on your list. Maybe next year you can get them one of their gorgeous freestanding tubs! BandaBeau: This collection of fashionable beach/pool accessories will impress even the hardest person on your list to buy for. BandaBeau has solved the annoyances that come with your poolside lounging. The Towel Tamer keeps your towel in place while marking your spot at a busy pool. There is also a secret pocket for your phone and room key. BandaBeau also makes luxurious extra-long towels and anti-microbial, waterproof bags for handy travel! Nuni: Every taco lover will adore this modern appliance that perfectly warms 6 tortillas at once. No more standing over the stove heating one at a time. Have a fun fiesta with this revolutionary device that will change Taco Tuesday forever! Once Upon a Book Club: A subscription from Once Upon A Book Club will be the gift that keeps on giving. Each month a gorgeous box will arrive at her front door complete with the book handpicked by a group of absolute bibliophiles AND 3-5 wrapped gifts to be opened at certain pages throughout the book. As seen on the Today Show, this hugely popular book club will be a favorite gift for that special gal in your life. Primo Grill: The ultimate gift for the BBQ lover in your life. The only made in the USA ceramic grill from Primo has a patented oval shape that will fit your veggies, bread and ribs for a complete meal that is definitely Pinterest worthy!